There are plenty of coolers with wheels, but they don’t measure up to this cooler. The extra-tough RovR Cooler covers ground more easily during camping and beach trips, and it keeps things cold for longer, too—up to 10 days. 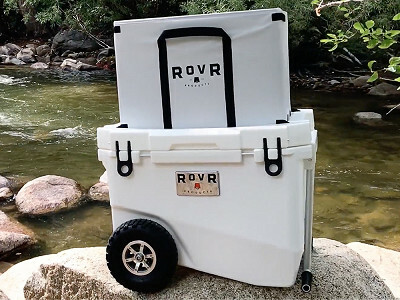 RovR might look similar to other premium, hard-core coolers, but it has a lot more going for it to make it easier to take on-the-go. 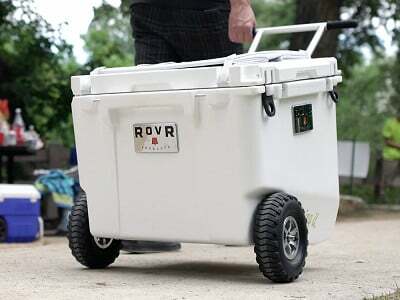 Puncture-resistant wheels and an extra-wide, aluminum dual-grip handle (that stops heel bumps) make it easy to steer the cooler over just about any terrain. An airtight gasket and thick foam insulation keep food and drinks sealed up tight, and a removable storage bin keeps wet and dry things separated and organized. There’s also a pop-up wagon bin to carry extra gear like chairs and blankets, and it folds back down into a padded seat. One too many trips with a wimpy cooler inspired Tom DeFrancia to make RovR. Tom wanted a mobile food and drinks command center for tailgating, outdoor parties, and other excursions. So his beefed up dream cooler combines functional add-ons, like cup holders and a prep board, with a rugged body that is rotomolded—the same way kayaks are made—so it can stand up to tough conditions. If your adventures happen on two wheels, there’s a bike attachment that lets the RovR tag along. And if your adventures get really wild, this cooler is even certified Grizzly bear-proof, too. What is the capacity of RovR? 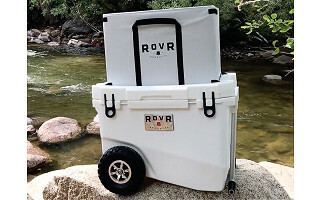 RovR coolers are available in 60 and 80 quart capacities. How long will the RovR cooler keep ice? Ice retention is difficult to put in numbers due to the many variables that affect it. That being said, we have been able to achieve over a week of ice retention in our testing and have reported 10+ days of ice retention. There are plenty of coolers with wheels, but they don’t measure up to this cooler. 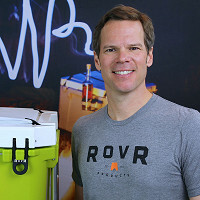 The extra-tough RovR Cooler covers ground more easily during camping and beach trips, and it keeps things cold for longer, too—up to 10 days. 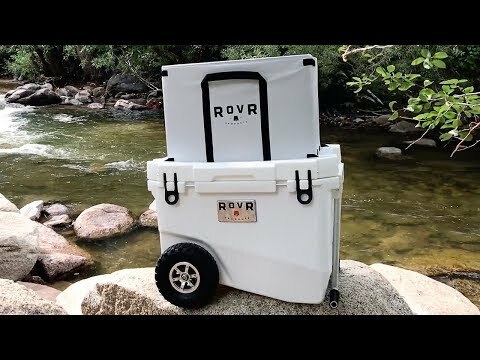 RovR might look similar to other premium, hard-core coolers, but it has a lot more going for it to make it easier to take on-the-go. Puncture-resistant wheels and an extra-wide, aluminum dual-grip handle (that stops heel bumps) make it easy to steer the cooler over just about any terrain. An airtight gasket and thick foam insulation keep food and drinks sealed up tight, and a removable storage bin keeps wet and dry things separated and organized. There’s also a pop-up wagon bin to carry extra gear like chairs and blankets, and it folds back down into a padded seat. One too many trips with a wimpy cooler inspired Tom DeFrancia to make RovR. Tom wanted a mobile food and drinks command center for tailgating, outdoor parties, and other excursions. So his beefed up dream cooler combines functional add-ons, like cup holders and a prep board, with a rugged body that is rotomolded—the same way kayaks are made—so it can stand up to tough conditions.